Five years ago the computer science and cognitive science communities deemed the use of rainbow color maps for display of scalar field data to be harmful [Reference 1]. More specifically, rainbow color maps are said to be “confusing, obscuring, and actively misleading.” Coincidentally, at this month's AIAA Aerospace Sciences meeting the invited paper by the University of Utah's Mike Kirby re-iterated that conclusion [Reference 2]. What should you use instead? Fortunately, Pointwise's Examine command for visualizing mesh quality metrics provides five choices for color bars (aka ramps) (see Figure 1), including the ability to reverse each of them. Unfortunately, not many people know about this capability. Figure 1: Five color bar types and the ability to reverse each of them are available in the Examine command. Figure 2, Figure 3, Figure 4, Figure 5, and Figure 6 illustrate the differences between Pointwise's five color bars: Spectrum, Full Spectrum, Modern, Red Blue, and Grayscale, respectively. A quick comparison reveals why Grayscale might address the concerns cited in Reference 1 in the respect that relative values are easier to discern. But regardless of which you prefer, they're all available to you. 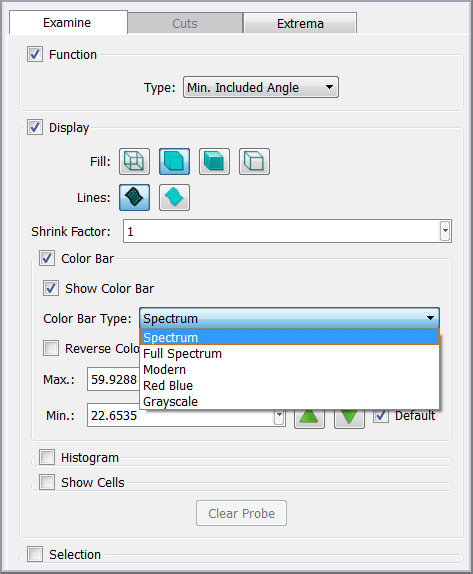 Figure 2: Minimum included angle for an unstructured grid around an airfoil displayed using the Spectrum color bar. Figure 3: Minimum included angle for an unstructured grid around an airfoil displayed using the Full Spectrum color bar. Figure 4: Minimum included angle for an unstructured grid around an airfoil displayed using the Modern color bar. 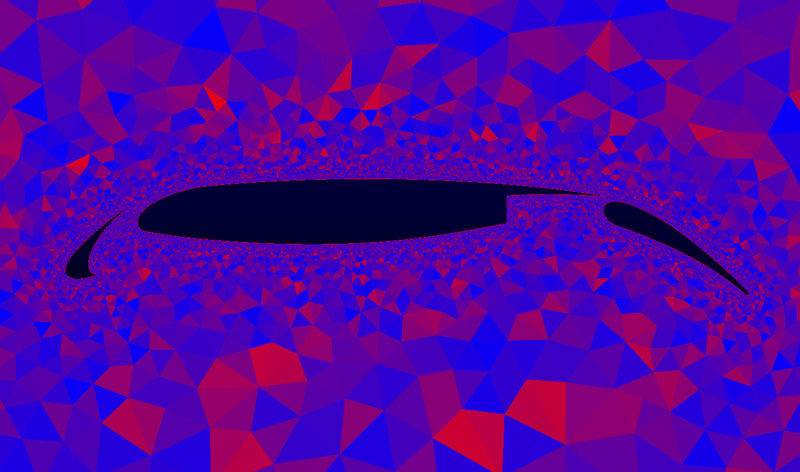 Figure 5: Minimum included angle for an unstructured grid around an airfoil displayed using the Red Blue color bar. Figure 6: Minimum included angle for an unstructured grid around an airfoil displayed using the Grayscale color bar. You might not think there's anything special about deleting things. But there's a big difference between the Delete (Del) and Delete Special (Ctrl+Del) commands. For example, when you select a block and press Delete, the block is deleted. However, its parent entities (domains and connectors) remain. If you want to delete an entity and its parents, press Delete Special instead. This applies to all topological entities from models and quilts, to blocks and domains. Figure 7: Knowing the difference between Delete and Delete Special can save you a lot of work. Depending on how error-prone or conservative you are, you can set the number of Undo levels in Pointwise as high as 20 (see Figure 8). The default value for number of Undo levels is five. The number of levels is simply the number of commands that can be undone relative to the grid's current state. Figure 8: Pointwise's Undo command can undo up to the last 20 commands (aka levels). What's important to keep in mind is how Undo works in Pointwise. Undo is implemented as a state machine rather than by reversible commands. That means Pointwise has to store the changes between successive states – in other words, the differences between the grid at each undo level. Furthermore, the differences are stored in memory; they are not rolled off to disk. Therefore, imagine the effect on your memory usage for any command that changes a block's interior grid points, such as running the Solve command. Obviously, your block will always contain the volume grid, but now the Undo stack also contains the previous version of the volume grid. That's two copies of your volume grid. You can see how that will start consuming a lot of memory. The flexibility of retaining 20 undo levels has to be weighed against the negative impact of increasing memory usage. In fact, you might consider reducing the number of undo levels to only one to have the best of both worlds – the ability to recover while minimizing memory usage. 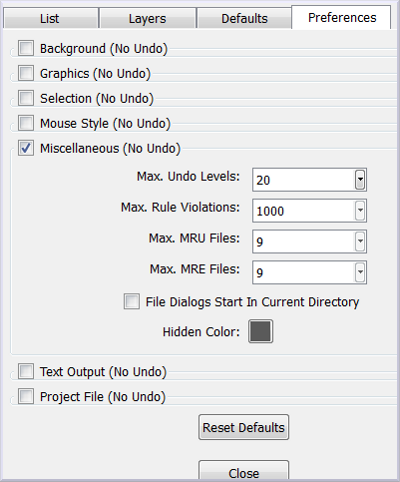 You can change the number of undo levels in the Edit, Preferences command in the Miscellaneous frame (see Figure 9). Figure 9: The Preferences command is where the number of undo levels can be set. There are many instances in which a command on the toolbar behaves differently than the same command in the menus. Intersect is one such command. Keep in mind that, in general, Intersect computes the intersection of all the entities in one set (Group A) with all the entities in another set (Group B). Let's assume you want to intersect two entities. If you select them and use Create, Intersect from the menu, the command assumes those two entities comprise Group A and it waits for you to select Group B. 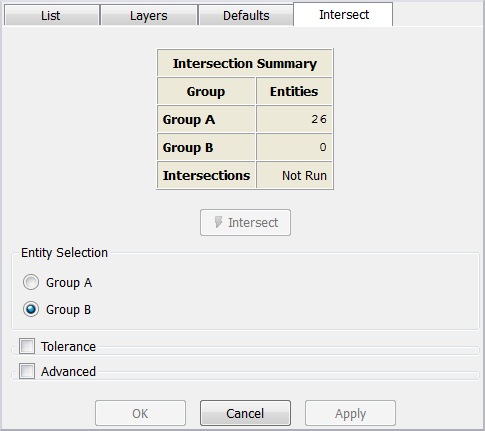 Figure 10: The full Intersect command panel gives you more options but takes longer to run. The faster way to intersect the two entities is to select them both and press the Intersect button on the toolbar. The toolbar implementation of Intersect computes the intersection of each selected entity with all other selected entities without opening the command panel. You can see how intersecting two or more entities with the menu bar (see Figure 11) is much faster. Figure 11: Invoking Intersect from the toolbar is a much faster way to apply the command. 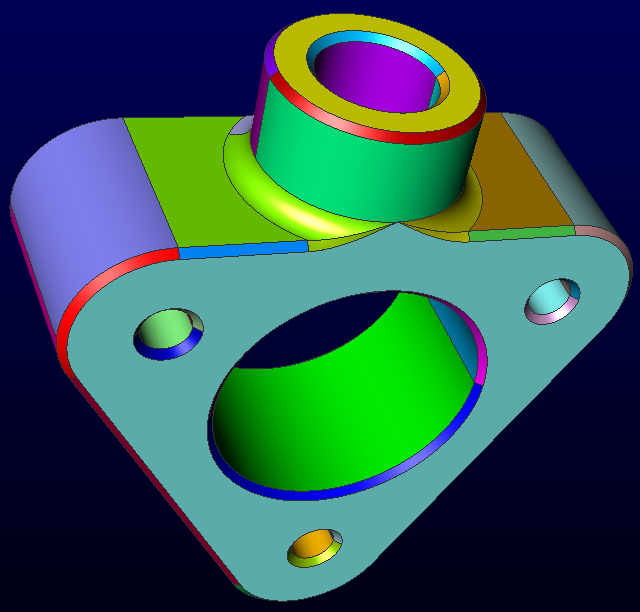 The challenges of dealing with CAD data are well documented. One of the most problematic aspects of working with CAD data involves handling the gaps and overlaps caused by tolerance and data translation issues. 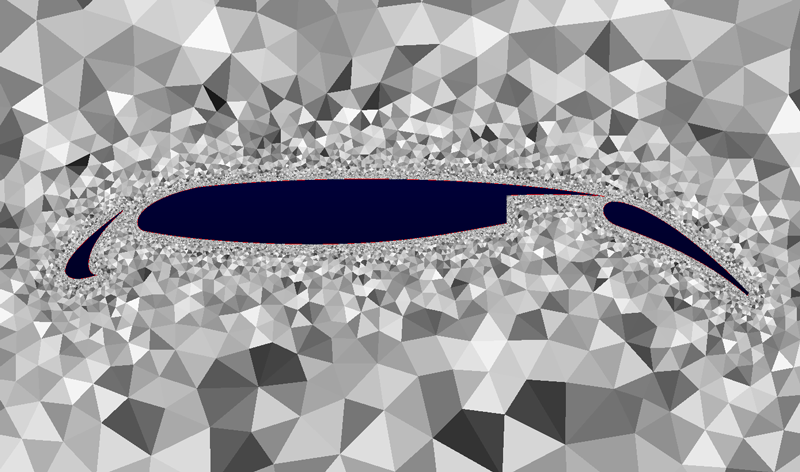 Pointwise offers two suites of tools for handling this: fault tolerant meshing and solid meshing. In the former, the mesh is “healed” over the CAD gaps primarily by using the Merge command. In the latter, the CAD geometry is assembled into a watertight solid model that's mesh-ready. For those of you unfamiliar with solid modeling, a solid is simply a topological entity in which surface geometry is knitted together like a quilt, resulting in an object that is watertight, hence the name solid model. In Pointwise, models can be open (like half an aircraft split down its centerline) or closed (like a flange or other mechanical part). Assembling models can be performed interactively through a process of selecting various CAD surfaces and setting a tolerance but that can often involve a bit of trial and error, depending on the CAD data's source and your familiarity with it. But in cases in which you are familiar with the CAD data, you can have the model assembled automatically during CAD import. As an example, consider the mechanical part shown in Figure 12. 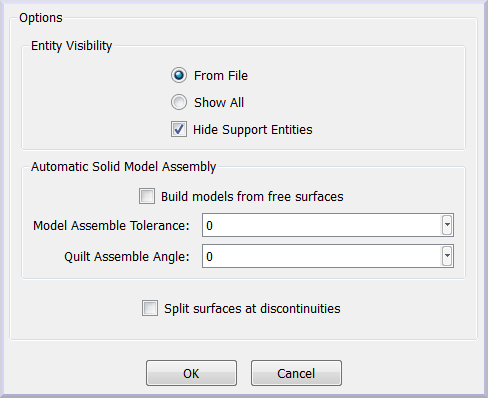 By default, the CAD data is imported without any attempt to assemble the solid model. 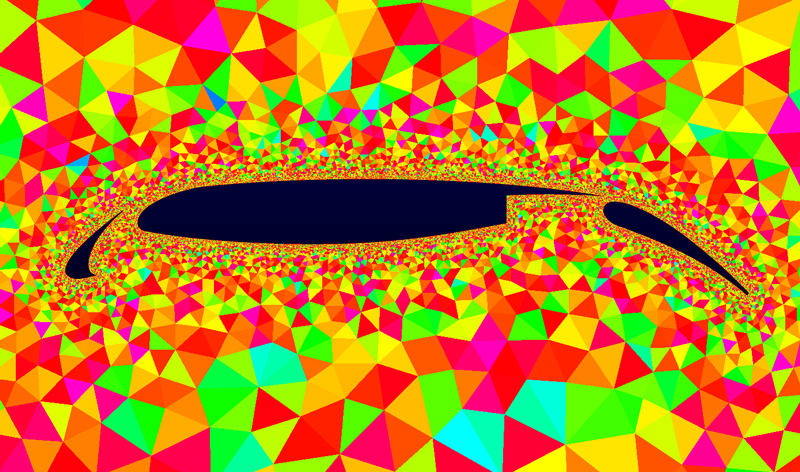 In Figure 12, the result is more than 60 disconnected surfaces (shown by colors). 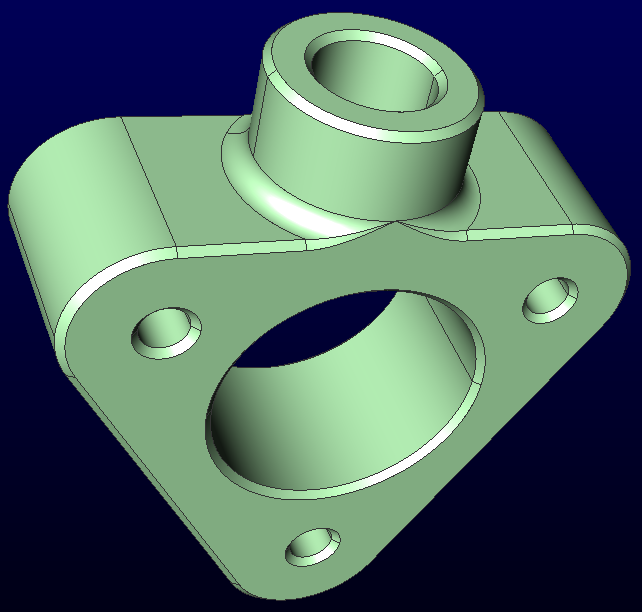 Figure 12: By default, a CAD part is imported without assembling a solid model, resulting in more than 60 individual surfaces in this case. For the mechanical part shown above, a single, watertight solid model is assembled automatically, as seen in Figure 14. 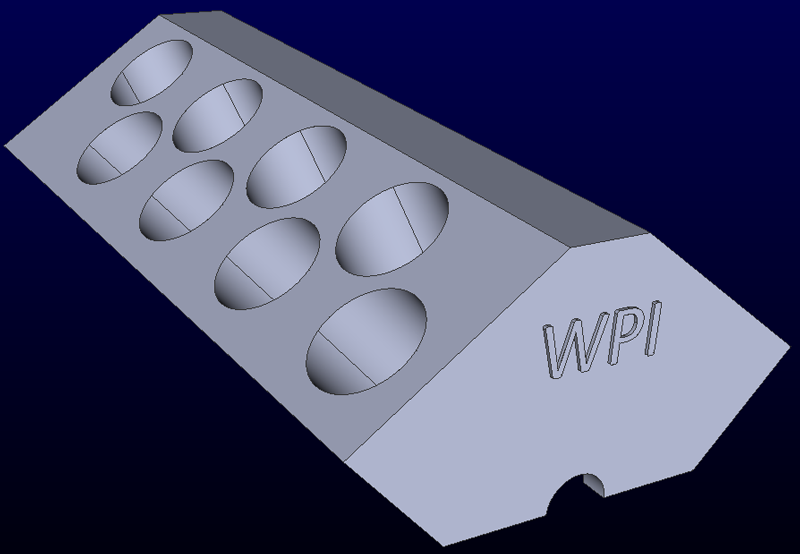 Figure 14: By setting the appropriate tolerance, the CAD data is automatically assembled into a single, watertight solid model that's ready for meshing. Almost everyone uses the Print to File (Ctrl+P) command to capture the Display window image and save it to a PNG, BMP, or TIFF image file. But few know that the companion Print to File Setup (Ctrl+Shift+P) command lets you customize how the image is saved. 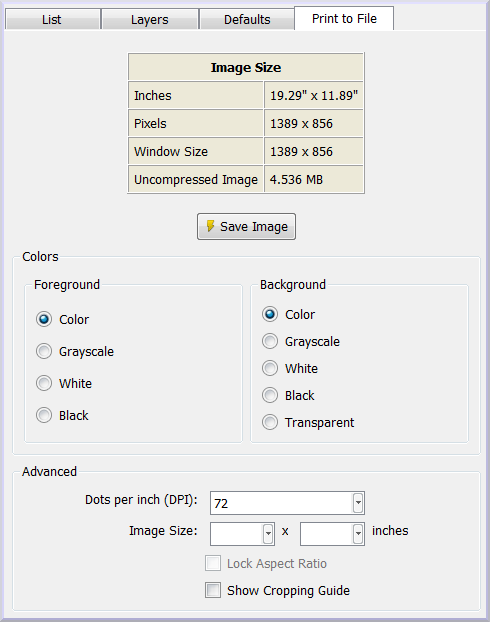 Figure 15: The Print to File Setup command gives you options for saving image files, including the ability to render at higher than screen resolution. The really interesting controls are in the Advanced frame, where you can create an image file at a higher resolution than what you see on the screen. For example, assume you need to produce an image for a print publication that will be printed at 300 dpi and needs to be 4 inches wide by 2.5 inches high. Once you enter those parameters in the panel, the Display window shows a cropping guide for your use in positioning the image. The table at the top of the panel lists the parameters of the image file to be created (see Figure 16). Figure 16: Print to File Setup lets you create image files at higher resolution than the screen image. Even when CAD data is imported accurately and correctly, it can still pose many challenges to mesh generation. One such challenge is the inclusion of excessive detail. These details (small holes, for example) complicate mesh generation while adding nothing to the analysis. Therefore, a goal for meshing would be to remove unnecessary detail. Figure 17: CAD geometry for a simplified engine block contains extra and likely unnecessary detail – the raised lettering. Assuming you don't need to include the extruded lettering in the mesh, it can be removed easily using the Untrim command. You're probably familiar with the two commands used to create trimmed surfaces – Trim by Surfaces and Trim by Curves. But Untrim is the one you want to use here. 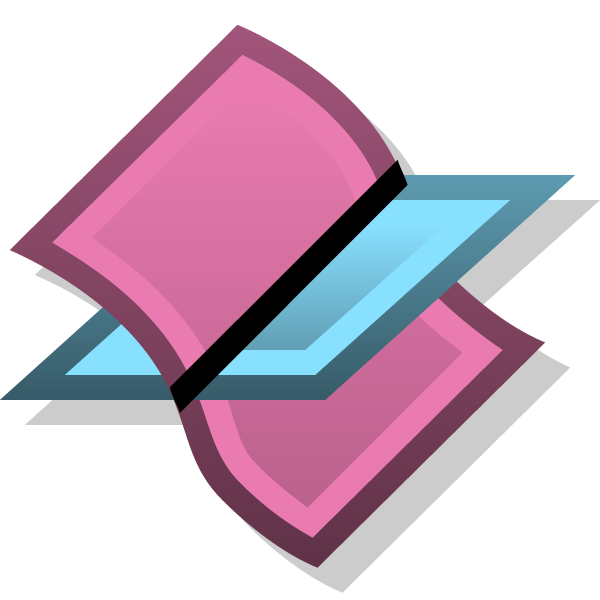 Untrim simply removes trimming curves from a surface. This differs from simply deleting the trimming part. For example, in Figure 17, if you just deleted the surfaces that comprise the raised lettering, the endplate of the engine block would still have three holes, cutouts for each of the letters (see Figure 18, left). Instead, you want to untrim the endplate by removing the curves that define the shapes of the letters, leaving the endplate untrimmed (see Figure 18, right). To accomplish this, you select the endplate's quilt (without digressing too much, a quilt is similar to a trimmed surface) and press Edit, Untrim. You see the quilt's trimming curves highlighted. Select those curves and press Untrim. Figure 18: The difference between deleting (left) and untrimming (right) when it comes to removing the excessive detail in Figure 17. Here's one last powerful but lesser-used command: Zoom to Selection (Shift+F2). If you want to get a close look at one particular entity, the easiest way to see it up close and personal is to click it and use Zoom to Selection in the View menu. The selected entity (or entities) will be positioned to fill the Display window. The best way to learn more about the breadth of functionality that Pointwise has to offer is to attend one of our training courses. 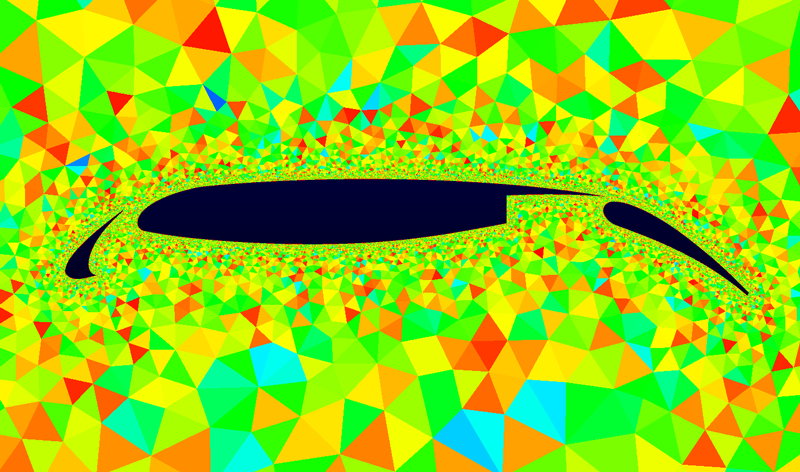 We have a course coming up at the Pointwise User Group Meeting 2013 in March. Come join us and see what you've been missing. David Borland and Russell M. Taylor II (2007). Rainbow Color Map (Still) Considered Harmful. IEEE Computer Graphics and Applications, March/April 2007, 14-17. M. Kriby, T. Etiene, C. Silva, (2013). “Flow Visualization” Juxtaposed With “Visualization of Flow”: Synergistic Opportunities Between Two Communities (Invited). AIAA Aerospace Sciences Meeting. Alan Cooper and Robert Reimann, (2003). About Face 2.0, The Essentials of Interaction Design. Indianapolis: Wiley Publishing. SolidWorks Teacher Blog, (2011). 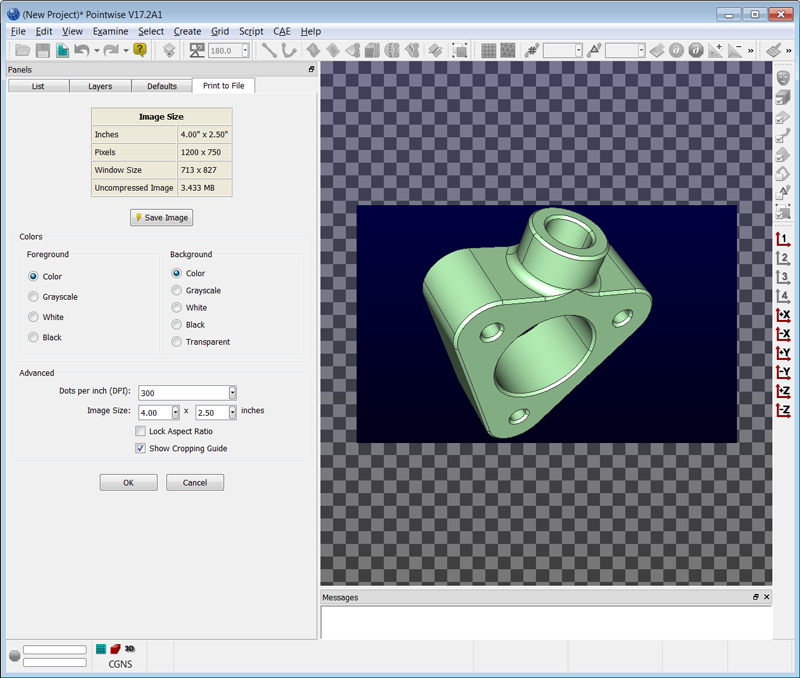 http://blogs.solidworks.com/teacher/2011/04/w16-engine-the-block.html.